David Rabel: "Nejmet gagne ce tournoi à égalité avec Little Goliath... Yace ne semble pas à l'aise dans cette variante." 8...Cd7 9.Cg3 Cxc5 10.Cb5 Rd7 11.a4 a6 12.Cd6 Cc6 13.Fe3 Fxd6 14.exd6 Fe4 15.Tg1 b6 16.c3 Dh4 17.b4 Cb7 18.b5 Ca7 19.Dd4 Cxd6 20.Dxb6 Thb8 21.Dc5 Dxh2 22.b6 Cc6 23.Fe2 Fc2 24.Ff2 Dh6 25.g5 Dh3 1-0(39) Pharaon 2.62 -- AnMon5.21; 11.Cd4 Ce4 12.f5 Cxg3 13.hxg3 exf5 14.gxf5 Fxf5 15.Cxf5 Cxf5 16.Dxd5+ Rc8 17.De4 g6 18.Fh3 Rb8 19.Ff4 g5 20.Td1 Dc7 21.Td7 Db6 22.Dxf5 gxf4 23.Fg2 fxg3 24.Txb7+ Dxb7 25.Fxb7 Rxb7 1-0(36) Yace 0.99.56 -- AnMon5.21. 10.a3 Fxc5 11.b4 Fd4 12.Dd2 Fb6 13.Fe2 0-0 14.Fb2 Cd4 15.Tc1 Cxe2 16.Dxe2 a5 17.b5 Cd7 18.f5 Fh7 19.Ca4 Tc8 20.c4 Te8 21.f6 dxc4 22.Txc4 Txc4 23.Dxc4 gxf6 24.exf6 e5 25.Tf1 Fd4 0-1(41) Yace 0.99.56 -- Pharaon 2.62. 11.Ff4 Fxc5 12.Ch5 0-0 13.Fd3 Cd7 14.De2 g6 15.Cf6+ Cxf6 16.exf6 Dxf6 17.0-0-0 gxf5 18.gxf5 Fxf5 19.Fxf5 Dxf5 20.Fxh6 Tfc8 21.Thg1+ Rh7 22.Fg5 Dg6 23.Fe3 Cd4 24.Txd4 Fxd4 25.Fxd4 Dh6+ 1-0(30) Yace 0.99.56 -- Nejmet 3.05. 16.Fb5 a6 17.Fa4 Fxc5 18.Fxg5 b5 19.Ff6 Tf8 20.Fb3 Fd4 21.De2 Dc7 22.Dg4 Fg8 23.Dxg6+ Ff7 24.Dg5 Cxe5 25.0-0-0 Tg8 1-0(35) Pharaon 2.62 -- Yace 0.99.56; 18...0-0 19.Ff6 Fe3 20.De2 Fd4 21.0-0-0 b5 22.Fb3 Fxc3 23.bxc3 Dc7 24.Dg4 Te8 25.Txd5 Ca5 =-=(108) Pharaon 2.62 -- Nejmet 3.05. 9.Cb5 Cec6 10.f5 exf5 11.Cd6+ Fxd6 12.cxd6 Dh4+ 13.Cg3 f4 14.Fxf4 Fe4 15.Tg1 g5 16.Fe3 Cxe5 17.Fe2 hxg4 18.Dd2 Cbd7 19.Ff2 Ff3 20.0-0-0 f6 21.Fxf3 gxf3 22.Dxd5 0-0-0 23.Da5 Dc4 24.Cf5 Tde8 25.Ce7+ Txe7 =-=(50) Yace 0.99.56 -- Little Goliath 2000 v3.6; 10...Fh7 11.Cd6+ Fxd6 12.exd6 0-0 13.Dd3 hxg4 14.Db5 Dc8 15.fxe6 fxe6 16.c3 Ce5 17.Cd4 Cbd7 18.b4 Cf6 19.Fe3 Ce4 20.Tc1 a5 21.a4 Fg6 22.d7 Cxd7 23.Cxe6 Tf3 24.De2 axb4 25.cxb4 Txa4 0-1(36) Yace 0.99.56 -- SOS.2 for Arena. 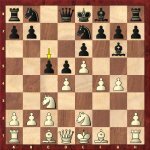 11...Fe4 12.Tg1 Da5+ 13.c3 b5 14.cxb6 axb6 15.b3 Fa3 16.Fc1 Fxc1 17.Dxc1 0-0 18.Fg2 b5 19.Cb2 Da3 20.Cd1 Da7 21.Fxe4 dxe4 22.De3 Cc5 23.b4 Cd3+ 24.Rf1 Dxe3 25.Cxe3 Ce7 0-1(105) Pharaon 2.62 -- SOS.2 for Arena. 16.Dxc1 b5 17.Cb2 0-0 18.Fg2 Db6 19.Dd1 Ta3 20.Dd2 Tfa8 21.Td1 Txa2 22.Cc1 T2a3 23.h3 Cc5 24.Df2 b4 25.c4 d4 0-1(45) Pharaon 2.62 -- Little Goliath 2000 v3.6. 9.dxc5 Da5 10.Fb5 a6 11.Fxc6+ Cxc6 12.Fd2 Cd4 13.f5 exf5 14.gxf5 Cxf5 15.Cxf5 Fxf5 16.Tf1 Fh3 17.Txf7 Rxf7 18.Df3+ Re8 19.Dh5+ g6 20.Dxh3 Dxc5 21.0-0-0 d4 22.De6+ De7 23.Dxe7+ Fxe7 24.Cd5 Tc8 25.Cxe7 Rxe7 0-1(47) AnMon5.21 -- Little Goliath 2000 v3.6. 9.Cb5 Cc8 10.f5 a6 11.Ca3 cxd4 12.fxg6 hxg6 13.Fe2 Db6 14.Rf1 Cxe5 15.Rg2 Fxa3 16.bxa3 Cc4 17.Fxc4 dxc4 18.Tf1 Dc6+ 19.Rg1 Dd5 20.Ff4 g5 21.Fd2 f6 22.De2 Cd6 23.Tae1 c3 24.Fc1 e5 25.Ch5 0-0 1-0(66) Nejmet 3.05 -- Little Goliath 2000 v3.6. 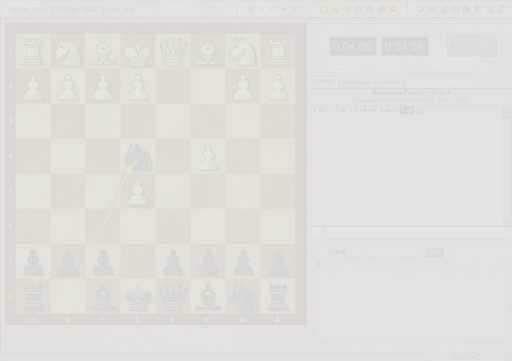 16.Cf4 Rc7 17.Cxg6 Cxg6 18.Tf5 Dd4+ 19.Dxd4 Cxd4 20.Txf7+ Fe7 21.Fd3 Cf3+ 22.Rh1 Rc6 23.Fe3 d4 24.Ff2 Rxc5 25.Ce4+ Rd5 =-=(55) SOS.2 for Arena -- Little Goliath 2000 v3.6. 10.exf6 gxf6 11.0-0 Ff7 12.f5 e5 13.dxe5 fxe5 14.g5 Cec6 15.Ch5 Tg8 16.Rh1 Txg5 17.Fxg5 Dxg5 18.Cg3 Ca6 19.a3 0-0-0 20.f6+ Rb8 21.Dg4 Dd2 22.De2 Dh6 23.Fg2 Fc5 24.Tad1 Cc7 25.Cf5 Dg5 1-0(83) Little Goliath 2000 v3.6 -- Yace 0.99.56. 10.0-0 Da5 11.a4 a6 12.gxf5 Fxf5 13.Cxf5 exf5 14.Fe3 Cbc6 15.Dd2 g6 16.Ce2 Dc7 17.Fg2 Tc8 18.a5 Dd7 19.Cc3 De6 20.Ca4 Cg8 21.Fxd5 Dxd5 22.Cb6 Dd8 23.d5 Cb8 24.Cxc8 Dxc8 25.Dd4 Ch6 1-0(39) AnMon5.21 -- Yace 0.99.56. 10.Fe3 Cbc6 11.0-0 fxg4 12.Fxg4 Dd7 13.Cb5 Cf5 14.Fxf5 exf5 15.b3 a6 16.Cc3 cxb3 17.axb3 De6 18.Df3 Cb4 19.Tf2 Tc8 20.Fc1 Ff7 21.Fa3 h5 22.Tg2 h4 23.Cf1 h3 24.Tf2 Db6 25.De3 Dc6 =-=(50) SOS.2 for Arena -- Yace 0.99.56. 16.Ce2 Cb4 17.Rd1 0-0-0 18.Cf4 Cc6 19.c3 Fe7 20.Tg1 Td7 21.Rc2 Tf8 22.Fd2 Rb8 23.Tae1 Tc8 24.e6 Tdd8 25.Te3 Ff8 1-0(47) Nejmet 3.05 -- Yace 0.99.56. 9...Rd7 10.Cxd4 Cbc6 11.f5 Cxd4 12.Dxd4 exf5 13.gxf5 Fxf5 14.Cxf5 Cxf5 15.Dxd5+ Rc8 16.Dxd8+ Rxd8 17.Fc4 f6 18.exf6 gxf6 19.Fd3 Ch4 20.Tf1 Fg7 21.Fd2 Te8+ 22.Rf2 Rc7 23.Fc3 Cg6 24.Tg1 Tg8 25.Tae1 Ff8 =-=(63) SOS.2 for Arena -- Nejmet 3.05; 15.Fh3 g6 16.Fxf5+ gxf5 17.Tf1 Tc8 18.Dxd5+ Re8 19.Dxd8+ Txd8 20.Txf5 Tg8 21.Tg5 Tg7 22.Tg3 Txg3 23.hxg3 Td5 24.Ff4 Fg7 25.c4 Td4 =-=(70) Little Goliath 2000 v3.6 -- Nejmet 3.05; 11.Cxc6 bxc6 12.a3 Re8 13.Fe3 Tb8 14.b4 a5 15.c3 Ta8 16.Fe2 axb4 17.cxb4 Dd7 18.Db3 d4 19.Td1 Da7 20.Fxd4 Dxa3 21.Dc4 Da2 22.Ta1 Dxa1+ 23.Fxa1 Txa1+ 24.Fd1 Ta3 25.f5 exf5 1-0(34) AnMon5.21 -- Nejmet 3.05. 16.b3 0-0 17.Fe3 Dd6 18.a4 Tac8 19.Ff3 Rh8 20.a5 Tfe8 21.Ta2 Cc5 22.Dd2 Tg8 23.Td1 Dc7 24.De1 Fh6 25.f5 Fxe3 =-=(72) AnMon5.21 -- Pharaon 2.62. 16.Rf2 d3 17.Fxd3 Ce5 18.fxg6 hxg6 19.Fxe5 fxe5 20.Fxg6 Dc5+ 21.Rg2 Th6 22.Dg4 Rh8 23.Taf1 Ca6 24.Cc3 d4 25.Ff7 Fe7 1-0(32) Little Goliath 2000 v3.6 -- Pharaon 2.62; 19.Fe2 De6 20.Fe3 Ca6 21.Cd4 Db6 22.b3 Fh6 23.Fxh6 Txh6 24.Rg2 Cc5 25.Dd2 Th7 1-0(52) Nejmet 3.05 -- Pharaon 2.62; 17.fxg6 Dc5+ 18.Rg2 Dxb5 19.Dg4 Cd4 20.gxh7+ Rf7 21.Fxd3 Db6 22.Dg6+ 1-0 SOS.2 for Arena -- Pharaon 2.62. 10...Db6 11.fxg6 hxg6 12.Cd6+ Fxd6 13.exd6 Cd7 14.Fe2 Cde5 15.a4 0-0-0 16.a5 Cxa5 17.Ff4 Cac6 18.Ta4 Dxb2 19.Fxe5 Cxe5 20.Txa7 Rd7 21.Da1 Dxa1+ 22.Txa1 Rxd6 23.Tb1 Tc8 24.Fd1 Tc7 25.Tb6+ Re7 0-1(38) Little Goliath 2000 v3.6 -- AnMon5.21; 14.Fd3 Cce5 15.0-0 Dxd6 16.Ff4 Db6 17.De2 Cxd3 18.cxd3 Tc8 19.Tac1 0-0 20.Txc8 Txc8 21.b3 Tc3 22.Td1 Dc5 23.Cf1 a6 24.Td2 De7 25.Fe5 Db4 0-1(69) SOS.2 for Arena -- AnMon5.21; 12.a3 Cxe5 13.Ff4 Cbc6 14.Fe2 d3 15.Fxd3 a6 16.Cc3 Dxb2 17.Cge2 Db6 18.g5 Cf3+ 19.Rf1 Dd8 20.Cg3 Cxg5 21.Rg2 Ch3 22.Fd2 Fd6 23.De1 Cf4+ 24.Fxf4 Fxf4 25.Td1 Fe5 1-0(111) Nejmet 3.05 -- AnMon5.21. 13.Df2 Cxe5 14.fxg6 hxg6 15.Fe2 Tc8 16.c3 Th4 17.0-0 Fc5 18.Fe3 Fxe3 19.Dxe3 Cxg4 20.Fxg4 Txg4 21.Tae1 Tc6 22.Rg2 f6 23.De2 Th4 24.Tf3 e5 25.Td1 Dd7 1-0(75) Nejmet 3.05 -- SOS.2 for Arena. 15.Fe2 Tf8 16.Dg5 Tf2 17.Dxd8+ Txd8 18.Fd2 Cxe5 19.Fc3 Cc6 20.Fxg7 e5 21.c3 e4 22.Td1 e3 23.Td3 Tf7 24.Fd4 Fxd4 25.cxd4 Te7 1-0(46) Little Goliath 2000 v3.6 -- SOS.2 for Arena. 16.Rd1 Tf8 17.Dh4 0-0-0 18.Dxh7 Cxe5 19.Dh3 Db6 20.Ce2 Tf3 21.Dh4 Cc4 22.b3 Fe3 23.Dg4 Tf5 24.Dh3 Fxc1 25.Rxc1 Ce3 0-1(92) AnMon5.21 -- SOS.2 for Arena.